Eileen O’Connell McCabe, age 85, died peacefully on November 3, 2018, at the Whitney Center in Hamden, CT. She was the wife of the late Donald Sanford McCabe of Caldwell, NJ, where she lived for sixty years before moving to Hamden. Don and Eileen raised their family in Caldwell and were very involved in the community. 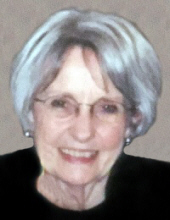 Eileen was a teacher in the Caldwell-West Caldwell public school system for 21 years, served on the Board of Trustees of the Caldwell Public Library, and was a longtime member of the Knollwood Tennis Club. She was a Brownie troop leader and a Cub Scout den mother but, above all, a devoted and loving mom, wife, sister, aunt and friend. Eileen is survived by her beloved sister, Kate Mellon; her three adoring children, Jennifer (Brad) Grisham, Amy (Dean) Baker, and Gavin (Maggie) McCabe; her six grandchildren, Conor, David, Gavin, Sarah, Meg, and Michael, and many nieces and nephews. She was predeceased by her brother, Maurice O’Connell and her sister, Rosemary Offner. Eileen was born on May 11, 1933, in Ticonderoga, NY and was raised in Pottersville, NY at The Wells House, the hotel owned and run by her parents, the late Maurice and Leila Geraghty O’Connell. She attended high school at the Emma Willard School in Troy, NY and graduated in 1954 with a teaching degree from Wheelock College in Boston, MA, now a part of Boston University. She started her teaching career in Fairfield, CT; where she met one of her roommates’ cousins, Donald, and they married and moved to New Jersey shortly thereafter. Eileen returned to teaching in Caldwell after her own children began school and continued tutoring for many years after her retirement. Eileen was loved and valued by all for her warmth, kindness, intelligence, and thoughtfulness. Friends are invited to visit with her family on Friday, November 16th from 4:00 to 8:00 p.m. at Paul Ippolito-Dancy Memorial, 9 Smull Ave, Caldwell, NJ. A Funeral Service celebrating Eileen’s life will be held the next morning at 11:00 a.m. in St. Peter’s Episcopal Church, 271 Roseland Ave, Essex Fells, NJ. Burial will be private. The family asks that in lieu of flowers any donations be directed to the American Lung Association, www.lung.org or to the Caldwell Public Library Foundation, www.caldwellpl.org. To send flowers or a remembrance gift to the family of Eileen O'Connell McCabe, please visit our Tribute Store. "Email Address" would like to share the life celebration of Eileen O'Connell McCabe. Click on the "link" to go to share a favorite memory or leave a condolence message for the family.